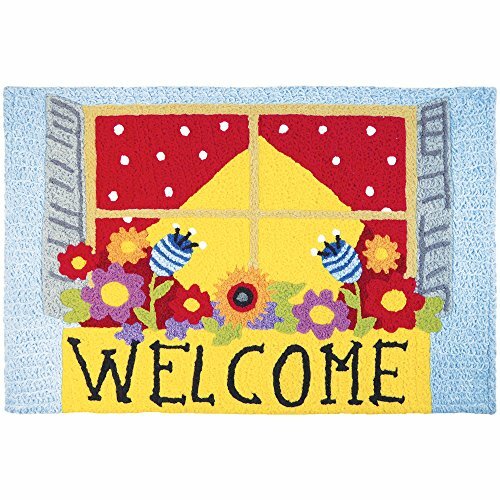 Welcome guests to your home or spruce up a room with a beautiful piece of floor art from Jellybean. Constructed with bright colorful polyester yarns, Jellybean rugs are very durable, fade resistant, and feature a special twisted hook construction, which keeps the yarn from picking and pulling. A special non-woven porous backing lets water seep through to reduce mildew. A percentage of the material in a Jellybean rug is recycled post-consumer PET plastic. Machine washable, this rug "Washes Better Than Your Jeans." The manufacture recommends a floor liner under this product to reduce slip and chemical reaction between your floor and the rug backing. Please Note: The digital images and product dimensions on our website are as accurate as possible. Due to differences in computer monitors, some rug colors may vary slightly. Lengths and widths may vary from the published dimensions. We do our best to provide you with an exact measurement, but please be advised that some variation exists. Patterns may vary slightly according to shape and size selected. If you have any questions about this product by Jellybean, contact us by completing and submitting the form below. If you are looking for a specif part number, please include it with your message.